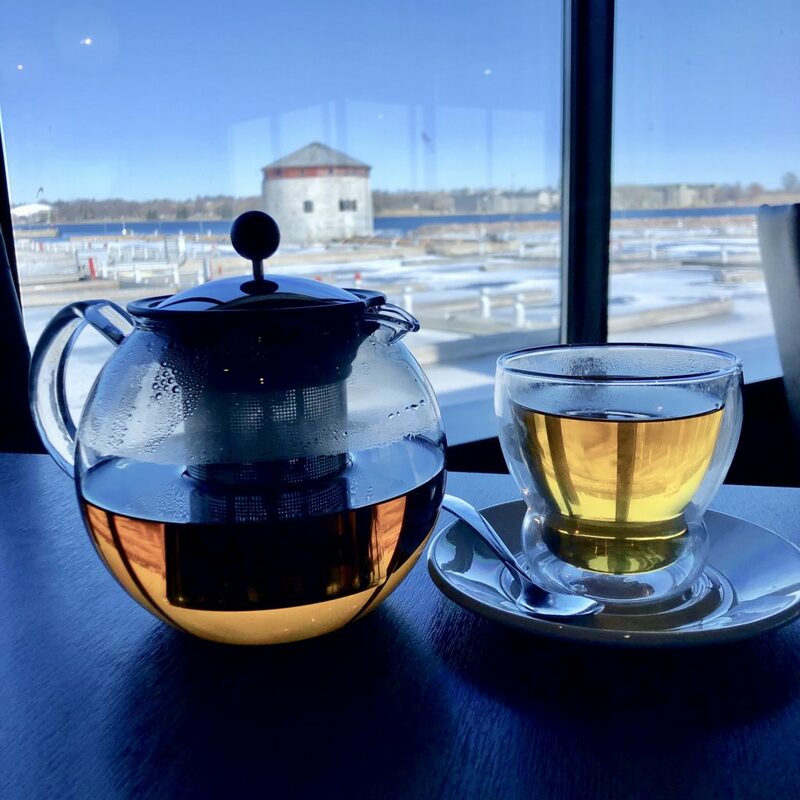 Imagine overlooking the Kingston Waterfront with a fragrant pot of fine tea and a tower of sweet and savoury treats fresh for your choosing. AquaTerra’s Afternoon Tea is perfect for any special occasion for both visitors and residents alike. Traditional Afternoon Tea was introduced in England in the 1800s to bridge the gap between lunch and dinner. This pause for tea became a fashionable and social event for upper-class women in the late 1800s; many of them changing into long gowns, gloves and hats before they spilled the tea with friends. AquaTerra’s spin on Afternoon Tea features the choice of 13 Pluck loose leaf teas, 4 tea-infused cocktails and a three-tiered serving tray of savouries, scones, and sweets. Working with local farmers, the chefs serve up a menu that’s inspired by international flavours blended with contemporary Canadian cuisine. Read on to learn more about the Afternoon Tea experience. With tea options including Masala Chai, Apple on the Green, Harvest Mint, and Verbena Blues – there is sure to be a flavour for any palate. 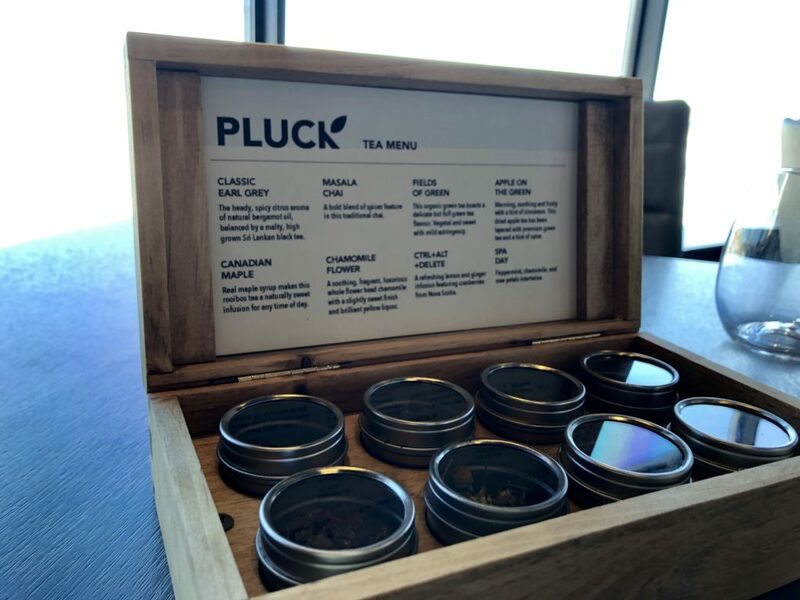 A great touch – the tea was brought out in a little sampling box for us to smell and test. We settled on Harvest Gold; a turmeric-based latte blend with locally milled cinnamon and ginger, and Canadian Maple; a herbal tea made with real maple syrup! Canadian Maple wasn’t too sweet and went perfectly with the treats. Harvest Gold was great for my partner, who was just getting over a cold! 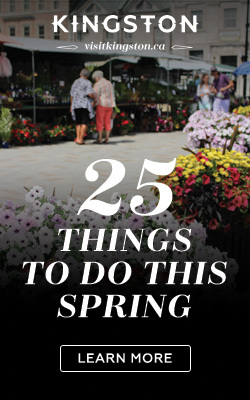 If you’re feeling adventurous, try out the tea-infused cocktails instead! 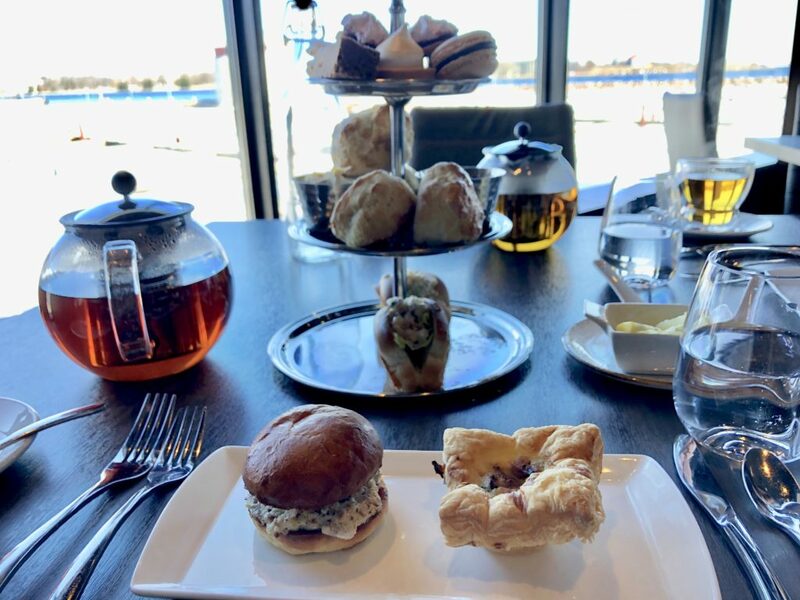 Traditional afternoon tea consisted of small sandwiches (think thinly sliced cucumbers, cooked ham, or cheese and pickles), but AquaTerra had a twist! 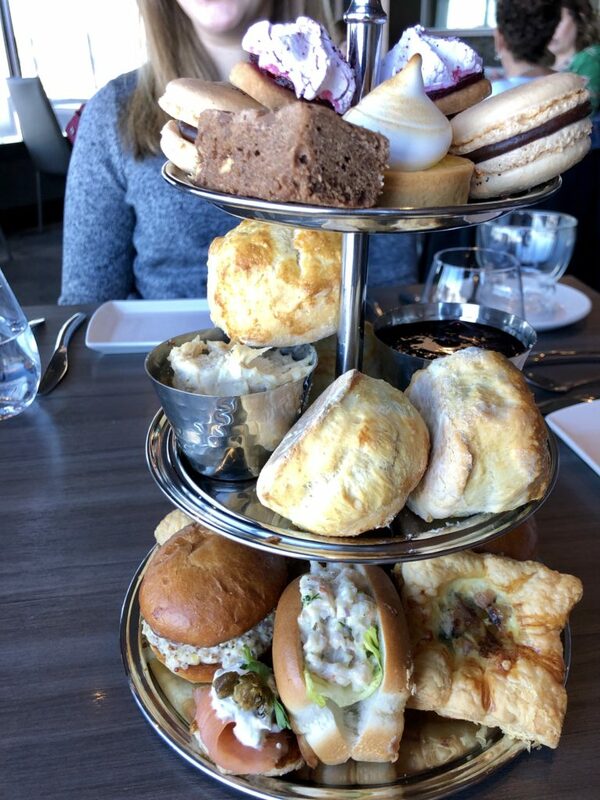 Their spin on afternoon tea was the ideal blend of East Coast dining and British traditions; featuring delicious Smoked Salmon, Shrimp Po’Boy, Quiche, and my personal favourite, the Chicken Waldorf! Below: Chicken Waldorf on a brioche bun with Hall’s apple butter, torched brie, and walnut dust (left), Quiche with Haanover Farms peameal bacon, spinach, and gruyere cheese (right). Below: Smoked Salmon on Ironwood Organics red fife blini, with caper chip and dill creme fraiche (left), Shrimp Po’ Boy on a brioche roll with Atlantic shrimp, tarragon aioli, celery and shallots (right). After finishing off the sandwiches, we moved on to the scones. The jam was by far the best part of this tier. 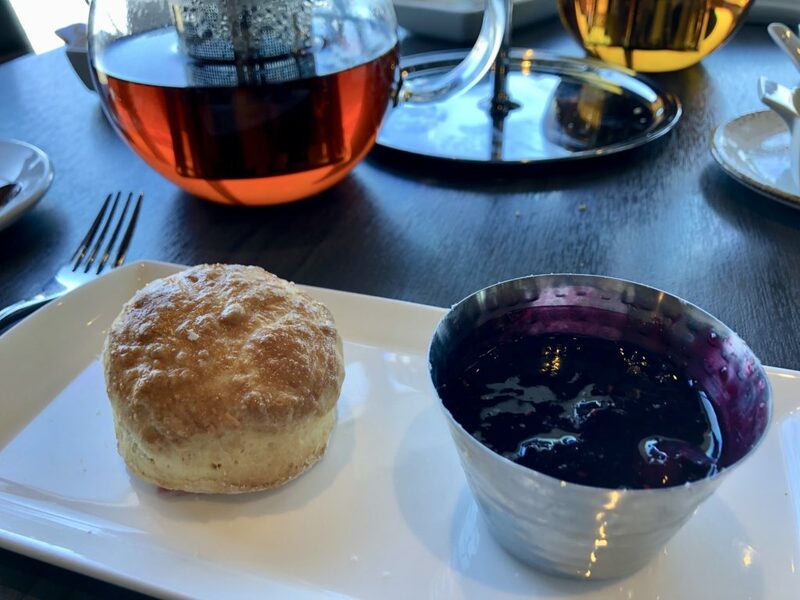 A quote from my partner, “If I could just eat a bowl of this jam, that would be perfect!” The scones were soft, delicious, and complimented the homemade jam and cream wonderfully. 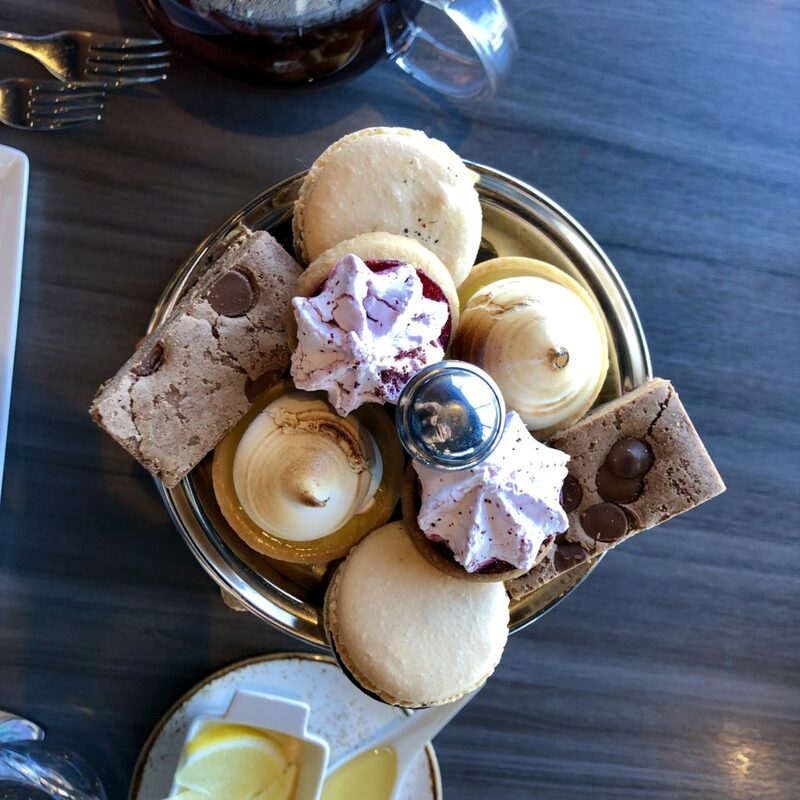 The final tier featured sweets and was the best way to finish off our Afternoon Tea experience. The treats included Lemon Tarts, French Chocolate Macarons, Raspberry Shortbread Meringue, and Triple Chocolate Brownies. There was a great balance between sweet and tart desserts! By this tier, we were pretty stuffed and opted for a to-go container (but managed to taste a sample of each treat!). Our favourite was the Chocolate Macarons – crispy on the outside and soft on the inside. Below: A close-up of these delicious desserts… Are you hungry yet? 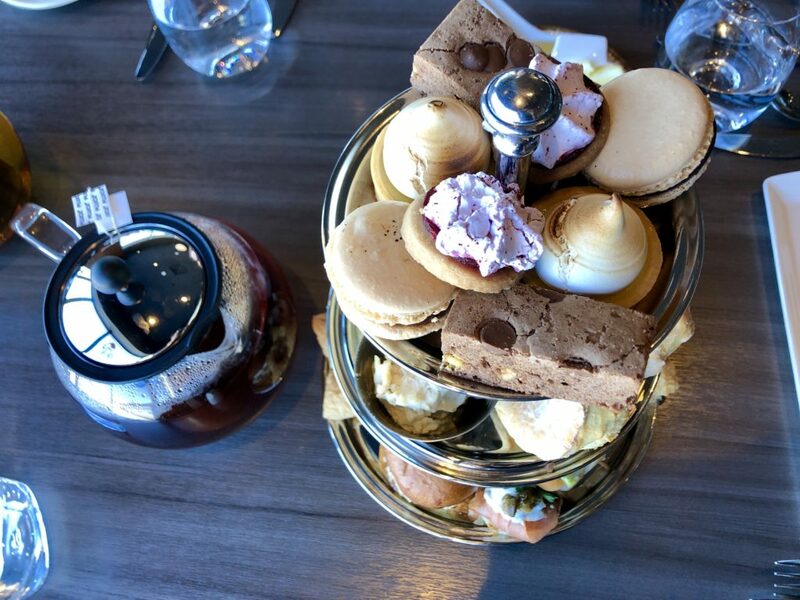 Afternoon Tea is served on Saturday at 1:30pm – 3:30pm and Sunday at 1:30pm – 4:30pm. Reservations are required. 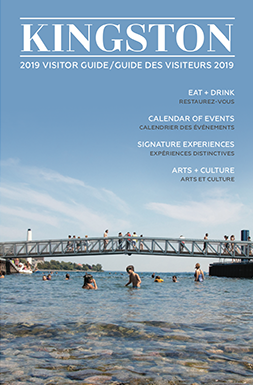 To reserve, call AquaTerra at 613-549-6243.